Nidesoft BlackBerry Converter Suite is excellent and powerful BlackBerry Converter software pack,including two hot BlackBerry Converter: DVD to BlackBerry Converter and BlackBerry Video Converter.The DVD to BlackBerry ripper function could help you to rip DVD to BlackBerry movie format with high speed and best quality. And the Video Converter for BlackBerry could convert video and audio files to BlackBerry Video, including AVI, Xvid, WMV,MOV,etc. 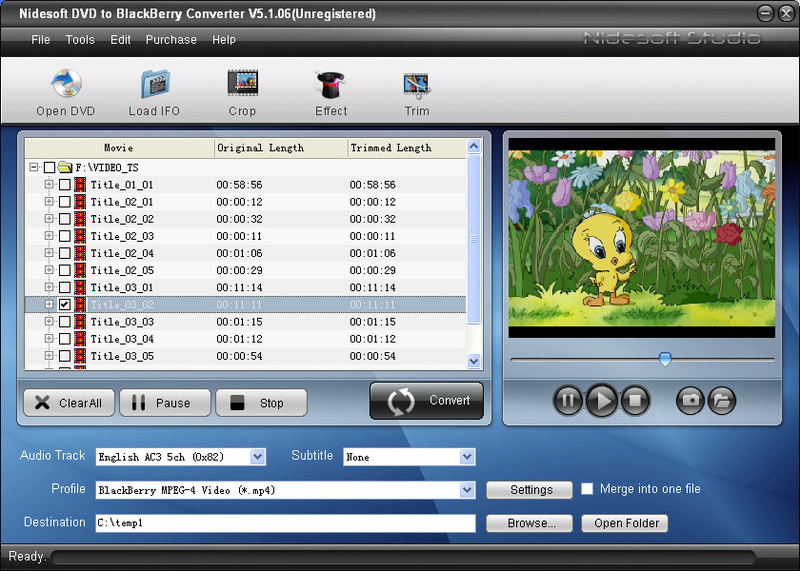 Nidesoft BlackBerry Video Converter provide advanced settings and options for you to convert Video and rip DVD. With the friendly user interface and easy to use funcions, you could set the Video Quality, Video Resolution and Crop Mode to stretch the picture. You can also choose the audio track and subtitle of DVD to meet your needs. (4) Support Fully support Dual-core or Multi-core processor, working with super high speed. Suite for convert DVD and video to Blackberry supported format. DRM remover,convert DRM-protected and non protected media to Blackberry. Qweas is providing links to Nidesoft BlackBerry Converter Suite 2.3.28 as a courtesy, and makes no representations regarding Nidesoft BlackBerry Converter Suite or any other applications or any information related thereto. Any questions, complaints or claims regarding this application Nidesoft BlackBerry Converter Suite 2.3.28 must be directed to the appropriate software vendor. You may click the publisher link of Nidesoft BlackBerry Converter Suite on the top of this page to get more details about the vendor.